Figure 2 Vicariant allopatric speciation. The appearance of a physical barrier divides a broadly distributed species into two physically isolated populations that diverge in traits that cause reproductive isolation in hybrids if the barrier breaks down and the two species come back into contact. The evolution of an intrinsic isolating mechanism causes both species to remain distinct when they develop overlapping geographic distributions. opposite sides of geographic barriers. A widely cited example is the desert pupfish complex (Cyprinodon) found in the Death Valley region of California. Drying of large pluvial lakes and rivers after the end of the last glacial maximum fragmented a single, widely distributed ancestral species into several distinct allo-patric species and subspecies that are now restricted to relatively small lakes, streams, and hotspring outflows. Some hybrids show evidence of sterility indicating the existence of post-zygotic isolation. Not all closely related species found today on either side of a geographic barrier necessarily diverged that way. For example, the existence of many closely related species found on either side of the Isthmus of Panama suggests that the formation of the Central American land bridge simultaneously split many widely distributed marine species into separate Pacific and Atlantic lineages. However, both molecular 'clock' analyses and examination of the fossil record indicate that some species pairs found today on either side of the isthmus diverged millions of years before even the earliest restrictions of water flow between the two oceans. This lack of temporal congruence in divergence times among geographically co-distributed taxa is known as pseudocongruence. In contrast, similar analyses of molecular genetic data from flowering plants show a striking congruence in divergence times among pairs of closely related species isolated in eastern North America and eastern Asia, implicating a single isolation event. Thus, the most convincing examples of vicariant speciation involve species whose modern distributions are not only concordant with a particular barrier, but whose biogeographic histories are also temporally consistent with the history of barrier formation. Natural selection is widely regarded as an important evolutionary force causing divergence in vicariant speciation. Dobzhansky and Muller developed a simple two-locus model that approximates the kinds of genetic changes envisioned by Mayr, and can be easily generalized to multiple loci. Consider a population fixed for the genotype A1A1B1B1 that is split into two by the formation of a barrier restricting gene flow. If selection in one population favors replacement of the A1 allele with a newly mutated A2 allele, but in the other population B1 is selectively replaced by B2, the two populations will be fixed for the A2A2B1B1 and A1A1B2B2 genotypes, respectively. If the A2 and B2 alleles are incompatible, causing hybrid sterility or inviability (i.e., complete post-zygotic isolation), the two populations will be reproduc-tively isolated if they come back into contact. Although these changes could be driven by selection, it is important to note that they could also be caused by genetic drift given that the A2 and B2 alleles are selectively neutral against the B1B1 and A1A1 backgrounds, respectively. Several investigators have shown that reproductive isolation has evolved as a by-product of adaptive divergence, a process called 'ecological speciation'. For example, the evolution ofmimicry appears to have played an important role in speciation in the butterfly genus Heliconius. The recently split sister species H. melpomene and H. cydno have diverged to mimic the color patterns of different model taxa (Figure 3 a), but strong assortative mating (preferential mating among individuals with similar phenotypes) based on the mimetic coloration results in substantial pre-zygotic isolation (Figure 3b). Rare hybridization events produce individuals with poorly adapted intermediate phenotypes, demonstrating that divergent patterns of mimicry also result in some post-zygotic isolation. Among plants, species in the genus Mimulus have evolved highly divergent floral morphologies that appear to be adaptations to different types of pollinators (either bees or hummingbirds) that in turn effectively reproduc-tively isolate sympatric populations. Using controlled laboratory experiments, several studies have also generated strong assortative mating among replicate lines of houseflies and species of Drosophila by subjecting them to artificial divergent selection on behavioral, morphological, and physiological traits. Control populations show little behavioral isolation, indicating that divergent selection, rather than genetic drift, caused the incidental evolution of pre-zygotic isolation. Sexual selection is also probably important in allopatric speciation given that divergence in sexually selected traits will necessarily diminish interbreeding. Many experiments have shown that among species where a female 'chooses' males to mate with, females make their choices based on sexually dimorphic traits in males, such as large body size, bright coloration, large antlers, and elongated tail feathers. Sexual selection is probably involved in the evolution of gametic incompatibilities and isolation in some marine organisms that release their gametes into the water column in mass spawnings, a scenario that results in intense sperm competition among males. Analysis of the underlying DNA sequences for some sperm surface proteins indicates that the evolution of these proteins is driven by selection. Rapid development of gametic incompatibility may explain how some populations evolve reproductive isolation during only brief periods of transient geographic isolation. Figure 3 Ecological speciation in Heliconius butterflies in which strong behavioral (i.e., pre-zygotic) isolation evolved as a byproduct of mimicry. (a) Molecular phylogenetic relationships of H. melpomene, H. cydno, and their co-mimics H. erato and H. sapho. 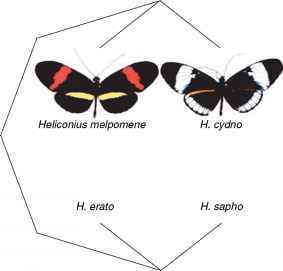 The molecular phylogeny establishes that similar coloration patterns involved the evolution of mimicry in one or both of the H. melpomene/H. cydno and H. erato/H. sapho lineages (rather than entirely as a consequence of common ancestry). (b) Time spent by males courting females with 95% confidence intervals for both H. melpomene and H. cydno from sympatric populations in Panama. Allopatric populations show weaker isolation, a pattern consistent with reinforcement of speciation. From Jiggins CD, Naisbit RE, Coe RL, and Mallet J (2001) Reproductive isolation caused by colour pattern mimicry. Nature 411: 302-305. Photos courtesy of C. Jiggins. they came back into contact they would produce viable hybrid offspring with lower fitness compared to 'pure' genotypes. 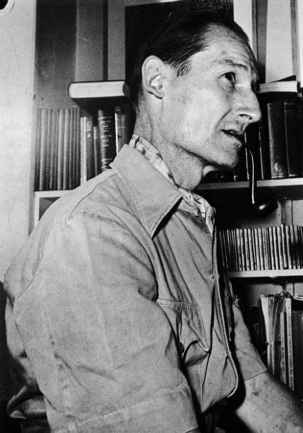 Theodosius Dobzhansky introduced the concept that if hybrid genotypes have reduced fitness, natural selection should favor the evolution of enhanced mate discrimination. This process, in which pre-zygotic isolation evolves as an adaptation to minimize the costly production of low fitness hybrids, is called 'reinforcement of speciation' or simply 'reinforcement'. Although intuitively appealing, several significant theoretical objections to reinforcement were initially raised and the idea quickly fell out of favor with most evolutionary biologists. More recently, the emergence of several compelling examples of reproductive character displacement, a pattern in which pre-zygotic isolation is stronger between species in sympatry than in allopatry, has fostered a revival of the hypothesis of reinforcement. In response to the empirical data, new theoretical models that focus on variables ignored by previous treatments now suggest that reinforcement is a potential outcome of partial post-zygotic isolation. However, even though the pattern of stronger behavioral isolation in sympatry than in allopatry is consistent with reinforcement, other processes can often explain the pattern of 'reproductive character displacement'. For example, populations with strong pre-mating isolating mechanisms that evolved in allopatry may simply be capable of coexisting, whereas populations with weaker isolating mechanisms may freely interbreed and genetically fuse when they come into contact. Thus, the fate of reinforcement in speciation theory depends on future studies that can clearly distinguish reinforcement from other plausible explanations. 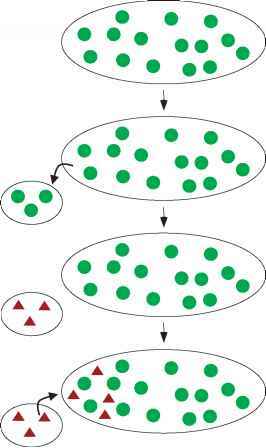 Figure 4 Successive stages in the process of peripatric speciation. A small 'daughter' population on the periphery of a more widespread 'parental' population evolves reproductive isolation. Both species remain distinct if the peripherally isolated species invades the geographic range of the parental species. Under this model, the peripherally isolated population diverges from the parental population such that the latter remains unchanged. isolated 'daughter' or 'derived' species. Peripatric specia-tion was developed from observations by Mayr, mainly of birds on islands in the south Pacific, that small, peripherally isolated populations are often highly morphologically divergent despite existing under ecological conditions similar to those experienced by the parental population. An important component of Mayr's peripatric theory -and a significant shift in his opinion about the genetic basis of adaptation - is that gene flow, stabilizing selection, and complex epistatic interactions among numerous genetic loci all place severe constraints on phenotypic evolution. Therefore, Mayr felt that unusual genetic conditions are necessary for speciation, and suggested that a new species will arise if the 'sampling' of a small number of colonists leaves a small population with a highly nonrepresentative sample of genetic variation at some loci. The genetic drift associated with this sampling of individuals is called 'the founder effect'. As a result of epistatic interactions among different genes, Mayr argued that a substantial change in allele frequencies at a small number of loci will briefly change the relative selective values of alleles at many other loci across the genome, triggering massive genetic change (a 'genetic revolution') and ultimately reproductive isolation. 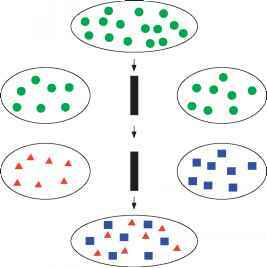 Unlike the Dobzhansky-Muller model of adaptive divergence, in which ecological differences experienced by allopatric populations drive phenotypic divergence, the peripatric model contends that changes in the 'genetic environment' of the peripheral isolate, caused by the founder effect, allow natural selection to generate novel combinations of alleles at numerous interacting genetic loci ('adaptive gene complexes'). Mayr noted that due to geographical localization and rapid pheno-typic evolution within peripheral isolates, intermediate phenotypes are probably rarely recorded in the fossil record. This last idea became an important component of Eldredge and Gould's highly influential but contentious theory of 'punctuated equilibrium', which united Mayr's peripatric model with the observation that new species often appear suddenly in the fossil record, fully morphologically differentiated from their closest relative. Peripatric speciation was favored by many evolutionary biologists in the 1970s and early 1980s. Widespread support for peripatric speciation was fostered in part by extensive research on Hawaiian picture-winged Drosophila (Figure 5), led by Hampton Carson, Kenneth Kaneshiro, and Allan Templeton. High endemnicity of species to single islands, with more recently derived species tending to occur on geologically younger islands, provides evidence that most speciation events in this group are associated with the colonization of newly formed islands from parental populations on older islands. The leaders of the Drosophila research program also developed their own genetic models. Although their models differed somewhat from Mayr's, most emphasized the role of the founder effect and the importance of changes in the genetic environment within a peripheral isolate. 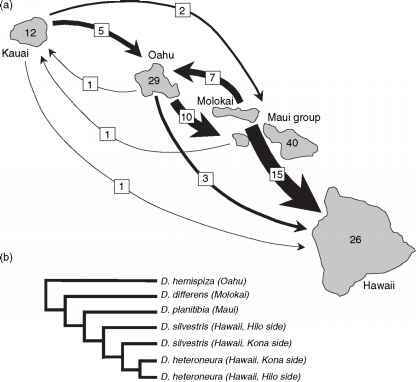 Figure 5 Inter-island colonization and speciation in picture-winged Drosophila of Hawaii. (a) Arrows indicate the minimum number of colonization events between islands, with the width of arrows reflecting the relative number of dispersal events (actual numbers are given in boxes). Note that colonization events are predominantly from older to younger islands. Numbers inside each island (or island group, in the case of Maui and Molokai) are the number of species found on each. (b) Phylogenetic relationships based on mitochondrial DNA for a subset of these species. More recently evolved species are found on younger islands, a pattern that corroborates the hypothesis that speciation is associated with dispersal between islands. Genetically distinct lineages of both D. silvestris and D. heteroneura on the Kona (southwest) and Hilo (northeast) sides of the island of Hawaii suggest that intra-island speciation has also occurred in this group. (a) Modified from Carson HL (1983) Chromosomal sequences and interisland colonizations in Hawaiian Drosophila. Genetics 103: 465-482. (b) Reproduced from DeSalle R and Giddings LV (1986) Discordance of nuclear and mitochondrial DNA phylogenies in Hawaiian Drosophila. Proceedings of the National Academy of Sciences of the United States of America 83: 6902-6906, with permission. explanations are possible, a large asymmetry in geographic range between parental and daughter species at the time of speciation is consistent with peripatric speciation. Phylogeographic studies (Figure 6) based on genetic loci that are neutral with respect to the speciation process also provide support for peripatric speciation if (1) the daughter species possesses a subset of the genetic diversity found in the parental species, indicating that the daughter species was formed from a relatively small population; (2) the parent is paraphy-letic with respect to the daughter species, meaning that some alleles or haplotypes found in the parent are more closely related to those found in the daughter species, but all alleles or haplotypes in the daughter species are derived exclusively from a single common ancestor (i.e., monophyletic). Although all geographic modes of speciation are expected to produce at least one species that is not initially monophyletic at some loci, observation of this pattern across physically unlinked loci supports the hypothesis that the putative daughter species was formed from a geographically localized parental population. Figure 6 Geographically localized speciation in rocky-shore Nucella. (a) N. ostrina. (b) N. emarginata. (c) Both mitochondrial DNA and allozyme data show a monophyletic N. emarginata nested within a paraphyletic N. ostrina (i.e., some lineages of N. ostrina share a more recent common ancestor with N. emarginata than with other lineages of N. ostrina), a pattern consistent with peripatric speciation. (d) Geographical variation in genetic diversity. Most populations of N. emarginata have fewer alleles per locus and lower heterozygosity (H) than N. ostrina, also consistent with peripatric speciation. Reproduced from Marko PB (1998) Historical allopatry and the biogeography of speciation in the prosobranch snail genus Nucella. Evolution 52: 757-774.
growth that outpaces the accumulation of new mutations) that happened after speciation. Even if a putative daughter species shows consistently low genetic variation across its entire geographic range, it is still impossible to determine if a bottleneck happened at the same time as speciation. A second reason why the popularity of genetic models of peripatric speciation has waned is that theoretical population geneticists have developed persuasive arguments against the potential role of the founder effect. Although more recent models of founder effect specia-tion have been more successful demonstrating that bottlenecks may actually facilitate adaptive evolution, laboratory tests involving bottlenecked populations of fruit flies (Drosophila) provide equivocal results. In fact, the mixture of outcomes from these experiments have been interpreted by both proponents and critics of peripatric speciation as either favoring or refuting, respectively, the importance of the founder effect in speciation. See also: Coevolution; Coexistence; Competition and Coexistence in Model Populations; Competition and Competition Models; Sympatry. Barraclough TG and Vogler AP (2000) Detecting the geographic pattern of speciation from species-level phylogenies. American Naturalist 155: 419-434. Barton NH and Charlesworth B (1984) Genetic revolutions, founder effects, and speciation. Annual Review of Ecology and Systematics 15: 133-164. Carson HL (1983) Chromosomal sequences and interisland colonizations in Hawaiian Drosophila. Genetics 103: 465-482. Carson HL and Templeton AR (1984) Templeton. Genetic revolutions in relation to speciation phenomena: The founding of new populations. Annual Review of Ecology and Systematics 15: 97-132. Coyne JA and Orr HA (2005) Speciation. Sunderland, MA: Sinauer. DeSalle R and Giddings LV (1986) Discordance of nuclear and mitochondrial DNA phylogenies in Hawaiian Drosophila. Proceedings of the National Academy of Sciences of the United States of America 83: 6902-6906. Dobzhansky T (1937) Genetics and the Origin of Species. New York: Columbia University Press. Eldredge N and Gould SJ (1972) Punctuated equilibria: An alternative to phyletic gradualism. In: Schopf TM (ed.) Models in Paleobiology, pp. 82-115. San Francisco: Freeman Cooper. Futuyma DJ (1998) Evolutionary Biology, 3rd edn. Sunderland, MA: Sinauer. Galindo BE, Vacquier VD, and Swanson WJ (2003) Positive selection in the egg receptor for abalone sperm lysine. Proceedings of the National Academy of Sciences of the United States of America 100: 4639-4643. Gotelli NJ (2004) Part 7: Assembly rules. In: Lomolino MV, Sax DF, and Brown F (eds.) Foundations of Biogeography, pp. 1027-1144. Chicago: Chicago University Press. Harrison RG (1991) Molecular changes at speciation. Annual Review of Ecology and Systematics 22: 281-308. Jiggins CD, Naisbit RE, Coe RL, and Mallet J (2001) Reproductive isolation caused by colour pattern mimicry. Nature 411: 302-305. Marko PB (1998) Historical allopatry and the biogeography of speciation in the prosobranch snail genus Nucella. Evolution 52: 757-774. Marko PB (2002) Fossil calibration of molecular clocks and the divergence times of geminate species pairs separated by the Isthmus of Panama. Molecular Biology and Evolution 19: 2005-2021. Mayr E (1942) Systematics and the Origin of Species. New York: Columbia University Press. Mayr E (1954) Changes in genetic environment and evolution. In: Huxley J, Hardy AC, and Ford EB (eds.) Evolution as a Process, pp. 157-180. London: Allen and Unwin. Empetrichthys, inhabiting the Death Valley region. Evolution 4:155-163. Muller HJ (1940) Bearing of the Drosophila work on systematics. In: Huxley JS (ed.) The New Systematics, pp. 185-268. Oxford: Clarendon Press. Schemske DW and Bradshaw HD (1999) Pollinator preference and the evolution of floral traits in monkeyflowers (Mimulus). Proceedings of the National Academy of Sciences of the United States of America 96: 11910-11915. Vincek V, O'Huigin C, Satta Y, etal. (1997) How large was the founding population of Darwin's Finches? Proceedings of the Royal Society London B 264: 111-118. Xiang Q-Y, Soltis DE, Soltis PS, Manchester SR, and Crawford DJ (2000) Timing of the eastern Asian-eastern North American floristic disjunction: Molecular clocks confirm paleontological estimates. Molecular Phylogenetics and Evolution 15: 462-472.